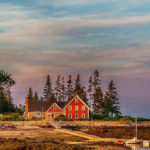 When she was a girl, going to the coast was “a big darn deal” for the owner of this cottage. She grew up in a hardworking, rural community near Bangor, and her family could not afford trips to the ocean. Now based in Texas with three grown children of her own, she and her family spend summers in Camden, where the “big darn deal” can be a daily pleasure. 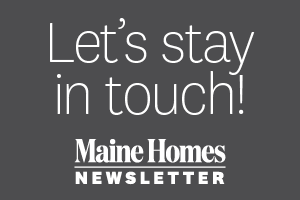 And yet, when an 1890 cottage overlooking Megunticook Lake and Maiden Cliff became available last year, nostalgia persuaded her to buy. 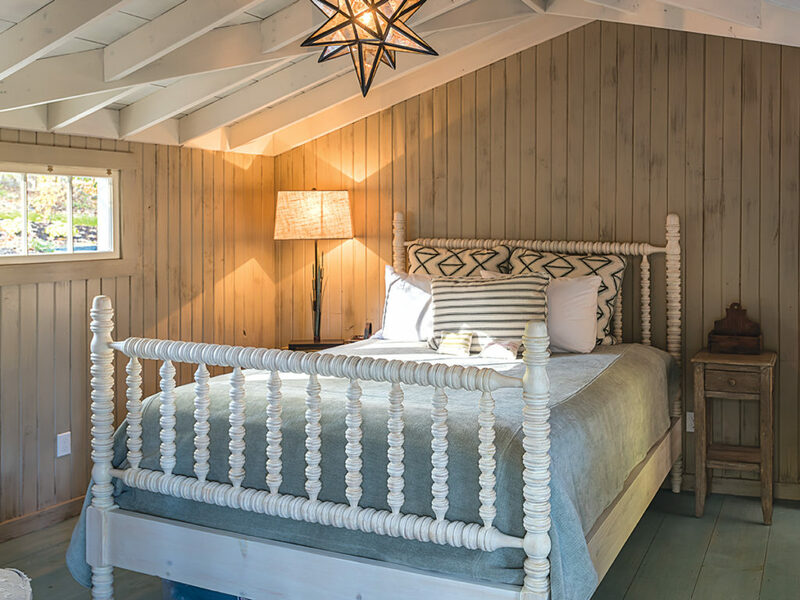 Beyond the idyllic, summer-camp-like–location, she was attracted to the unassuming, cozy character of the home, which she decided to renovate on the sly and present to her children as a surprise. 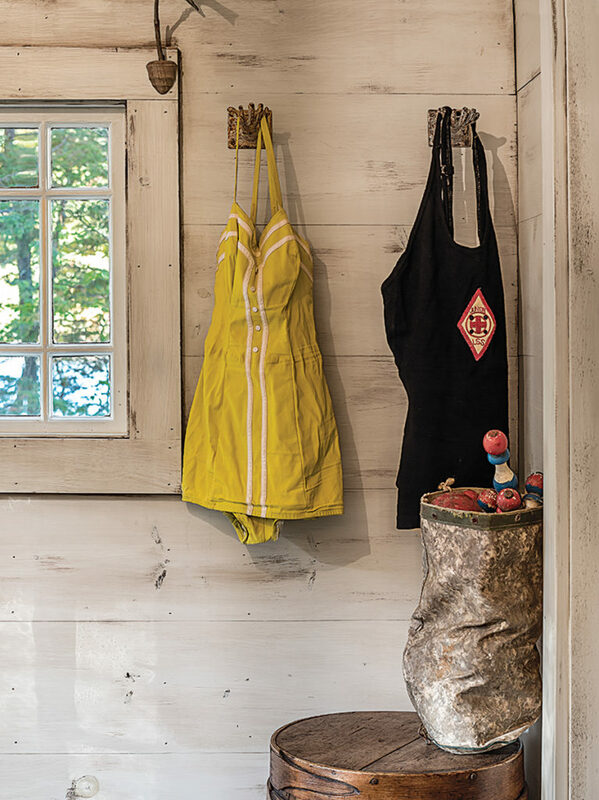 <strong>TIP:</strong> To age painted wood, sand then apply antiquing glaze with a rag, then a brush; finish with clear sealer. 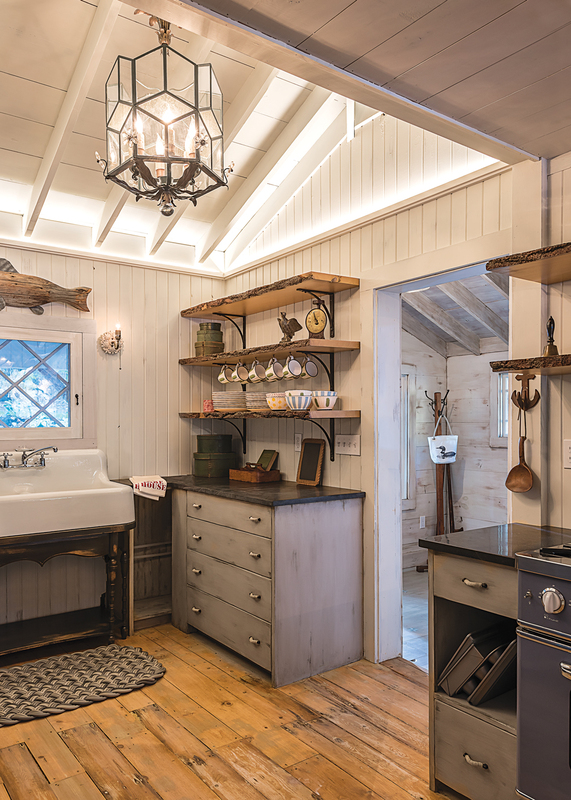 The kitchen features slate-topped cabinets and live-edge pine shelves crafted by Rockport’s Phi Builders + Architects. 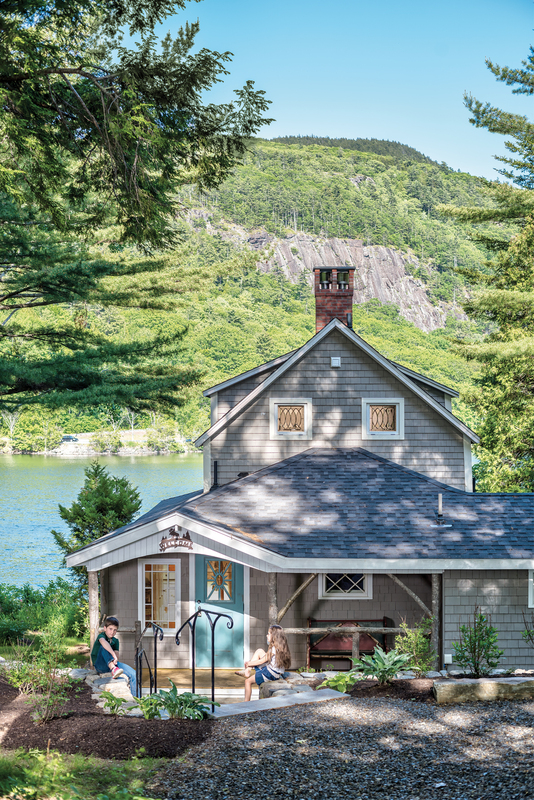 Contractor Rob Troxler, of Rockport’s Phi Builders + Architects, describes the original cottage as largely cobbled together, probably by do-it-yourselfers, over many decades. 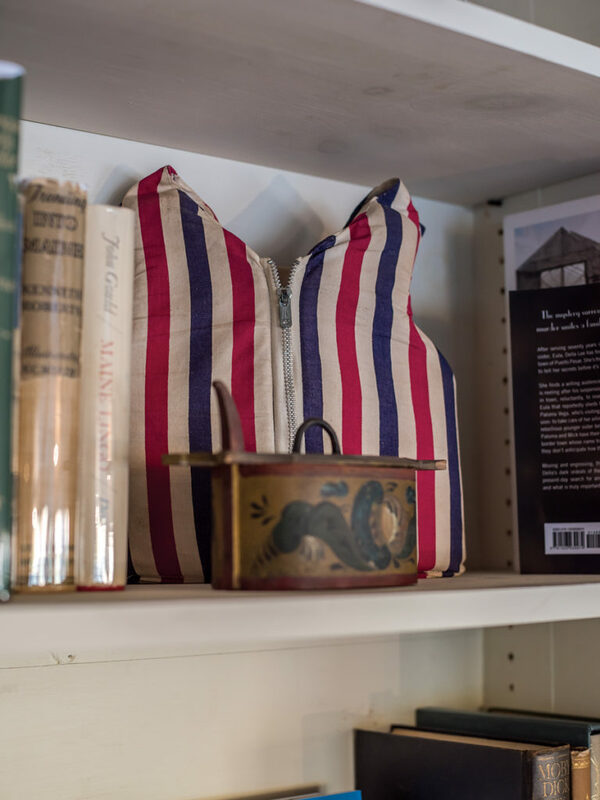 The handmade quality gave the place some head-scratching quirks (such as a birch-bark–covered post studded with lamps in the living room), as well as structural problems, the pier foundation being the first thing that needed attention. His team gutted the house, leaving the external walls, roof sheathing, and exposed studs and rafters more or less intact. Then they rebuilt, updating and insulating, while Megan van der Kieft, of Camden’s Margo Moore Interiors, made design choices “to suggest,” she says, “that someone once lived here.” She enlisted decorative painters Peter Walls and Allegra Kuhn, of Two Itinerant Artisans in Stockton Springs, to distress cabinets, vanities, and walls, several of which she adorned with antique swimsuits, bathing caps, and children’s life jackets. In the kitchen and powder room, a cast-iron sink, original to the home, and an antique copper bucket, repurposed as a sink, rest on what appear to be salvaged bases (but aren’t). 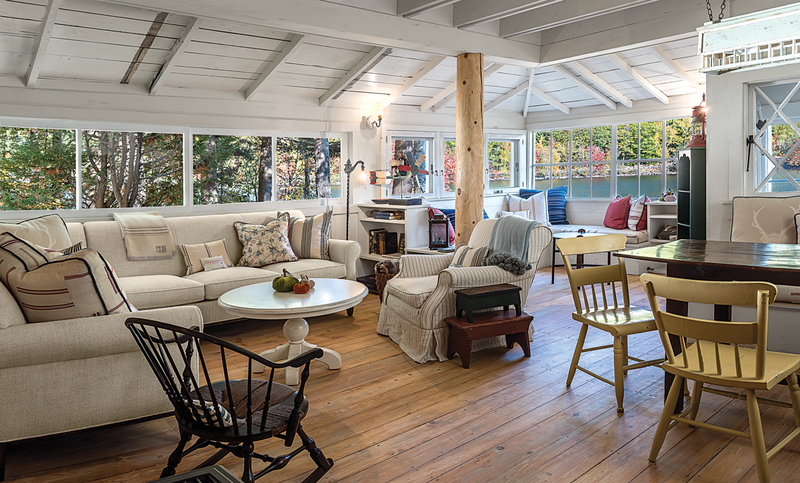 When a cottage on Megunticook Lake became available, nostalgia persuaded her to buy. Steel collar ties replaced lower wooden ones, lightening the master bedroom. 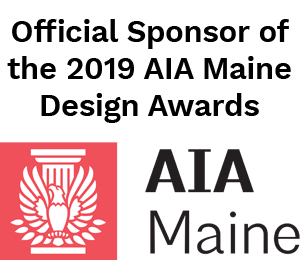 <strong>TIP:</strong> To winterize and retain the rustic look of exposed rafters, insulate the roof, then lay new roofing on top. A new pine post delineates seating areas in the living-dining room. 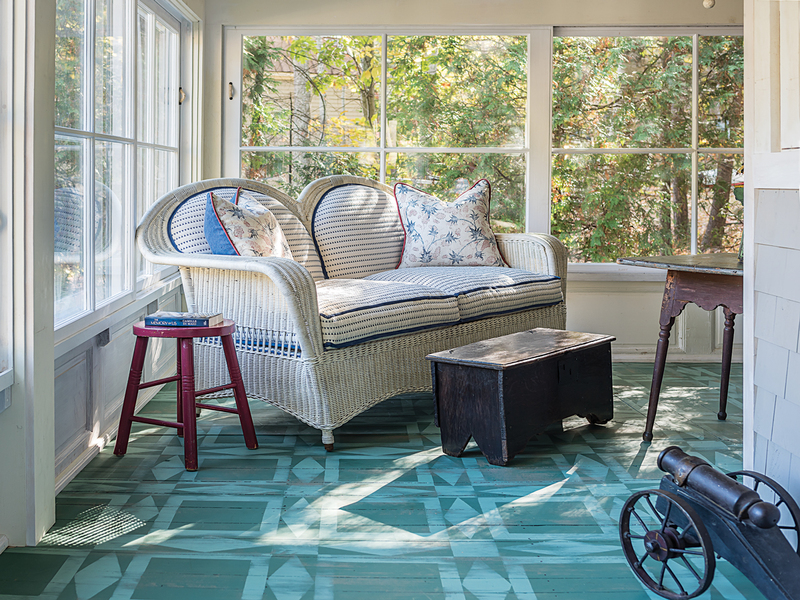 An antique quilt pattern inspired the sunporch's painted floor. 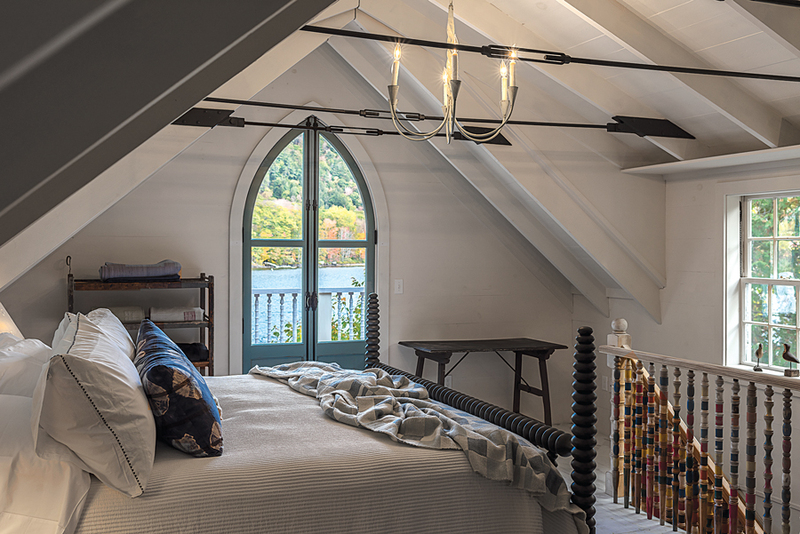 Camden's Margo Moore Interiors supplied the guest room's spool bed. 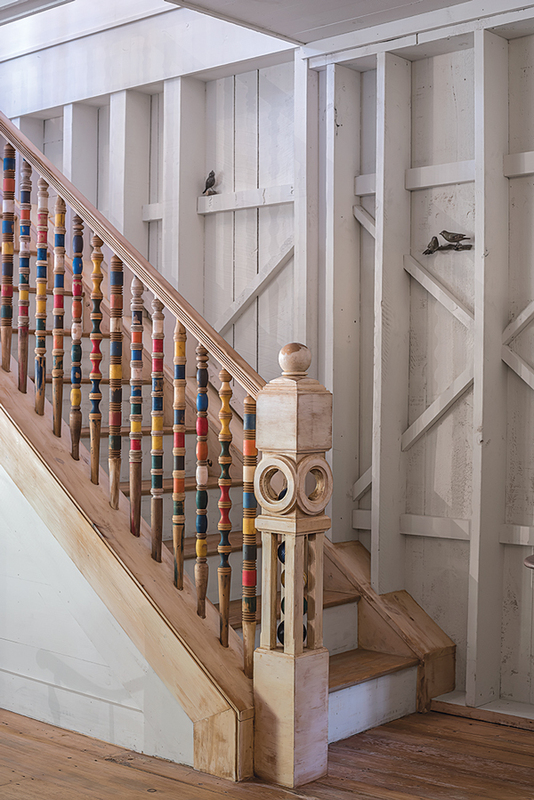 She had a vision of balusters resembling croquet mallet handles. Fanciful touches abound, including antique swimsuits. 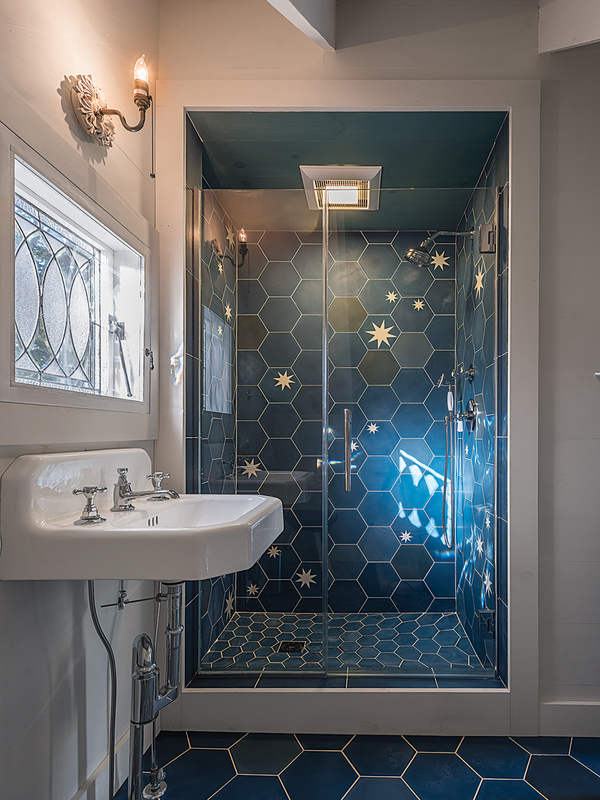 Midnight-blue concrete tiles turn the shower into a skyscape. A diverse mix of salvaged windows (with leaded glass, stained glass, and diamond-shaped mullions) and doors round out the patchwork. 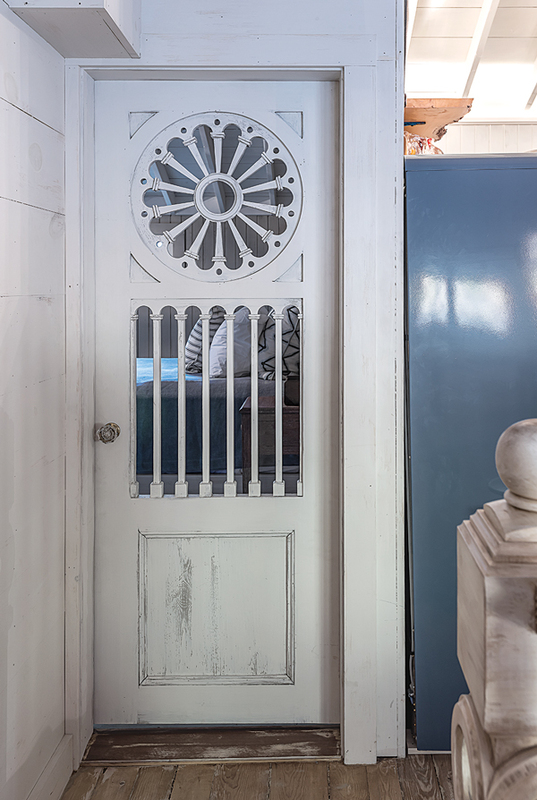 A circa 1900s door with a cutout rosette pattern the homeowner found in her late-mother’s basement with a note that said, “Please save to be used for another time” sets off the first-floor bedroom. 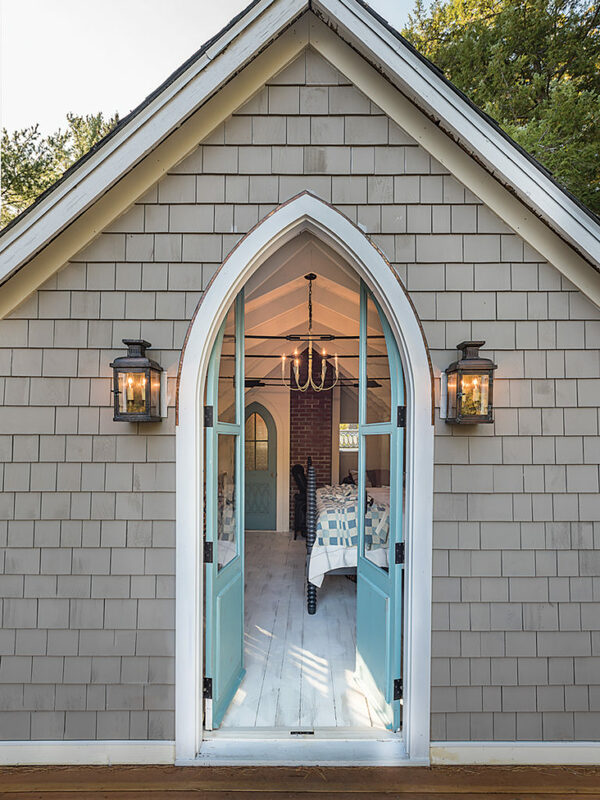 In the upstairs master bedroom, an early-20th-century Gothic arched door, painted vivid teal, distills the woodsy-watery view in its windowed frame. A new arched door, painted to match and fitted with frosted glass and a crystal knob, gives way to the adjacent master bath. 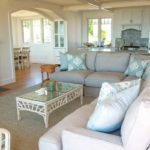 When the owner revealed the cottage to her family last fall, they were eager to line up summer stays. 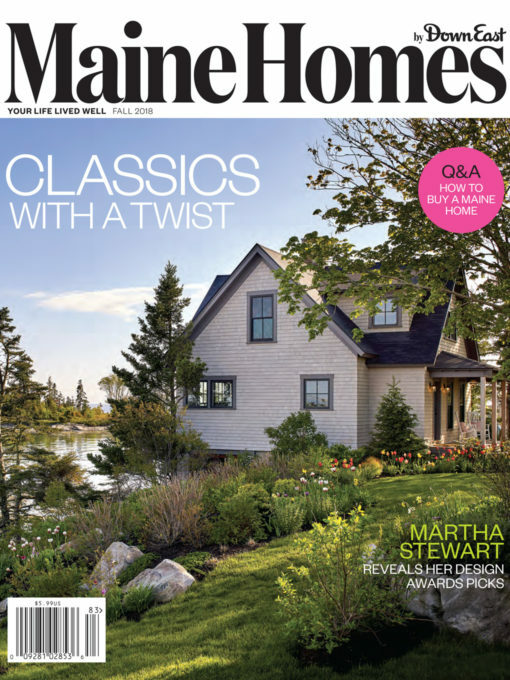 She’ll host nieces and nephews too and, down the road, she imagines weddings on the grounds, offering new visitors the have-the-lake-and-the-ocean-too pleasures of an inland shorefront home in a coastal town. Beautiful architectural and design work!